Brevet Brigadier General of U. S. Volunteers, 1 August 1864 for gallant and meritorious service in the engagement and defenses of Richmond on the Brock Turnpike and at Trevillian Station, Virginia. Brevet Major General, 13 March 1865 for gallant and meritorious services in the war. 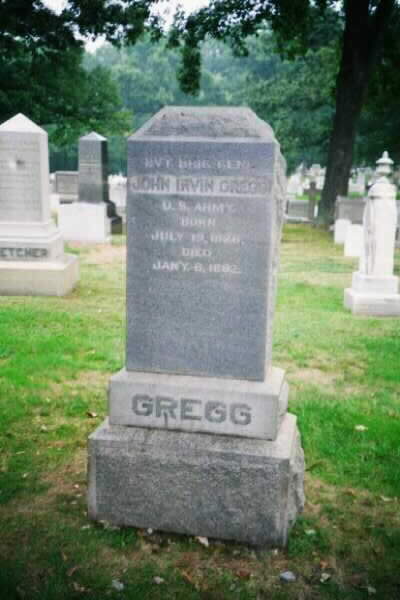 John Irvin Gregg (July 19, 1826 – January 6, 1892) was a career U.S. Army officer. He served with particular distinction during the American Civil War in the Union Army. 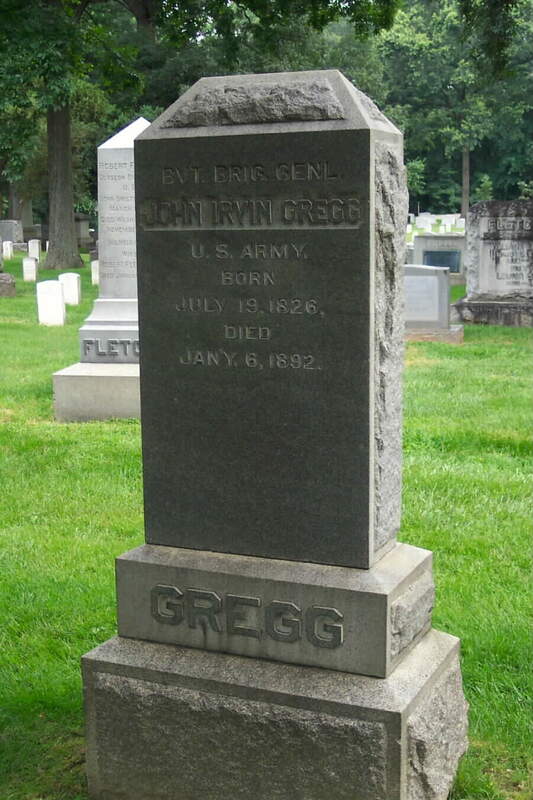 "Long John" Gregg was born in Bellefonte, Pennsylvania. He was the grandson of Andrew Gregg (a U.S. Senator from Pennsylvania) and the cousin of future Civil War general David McM. Gregg. He was also related to Pennsylvania governor Andrew Gregg Curtin. Gregg served in the "Centre Guards," a Centre County militia unit, as a lieutenant. During the Mexican-American War, he enlisted as a private in the 2nd Pennsylvania Volunteer Infantry, then receiving promotions to first lieutenant and captain in the 11th U.S. Infantry, serving as a recruiting officer. He was honorably mustered out on August 14, 1848. He entered the iron industry with the firm Irvin, Gregg & Co., owned by family members. He married Harriet Marr, the daughter of a local Presbyterian minister and schoolteacher. They had two sons, Irvin and Robert. When the Civil War broke out, Gregg was commissioned a captain in the 3rd U.S. Cavalry in May 1861. He joined the volunteer army in June as a captain in the 34th Pennsylvania Infantry. He resigned soon afterwards to accept a commission in the Regular Army as a captain in the 6th U.S. Cavalry. On November 14, 1862, Gregg was promoted to Colonel of the 16th Pennsylvania Cavalry. He then commanded many different cavalry brigades in the various reorganizations of the Army of the Potomac. He earned a brevet promotion to major in the Regular Army in March 1863 for "gallant and meritorious service" at the Battle of Kelly's Ford. A month later, he was given command of a division in the cavalry corps. He led it during the Chancellorsville and Gettysburg Campaigns. In October 1863, he earned another brevet (to lieutenant colonel) in the Regulars for the Battle of Sulphur Springs. He was wounded at the Second Battle of Deep Bottom and won a brevet again in October 1864, this time to colonel in the Regular Army. He was promoted to Brevet Brigadier General of U. S. Volunteers on August 1, 1864, for gallant and meritorious service in the engagement and defenses of Richmond on the Brock Turnpike and at the Battle of Trevillian Station. In April 1865, he was slightly wounded at the Battle of Sayler's Creek, and was captured the next day north of Farmville, Virginia. At the close of the war, Gregg became a brevet major general in the volunteers and brevet brigadier general in the Regular Army. He was named Colonel of the 8th U.S. Cavalry in July 1866, a position his cousin David Gregg had desired. He reported for duty at Camp Whipple in the Arizona Territory. He led a series of expeditions against Indians into the Mojave Desert. He was sent to the New Mexico Territory, where he commanded Fort Union from 1870–72, and led efforts in that region to pursue and subdue the Apache. In 1872, he led a reconnaissance expedition to survey and map the panhandle region of Texas. Gregg retired from active service on April 2, 1879. He is buried in Arlington National Cemetery.